Thanks for including me as a guest blogger. My name is Saffron Craig I have been quilting now for about 5 years. Most of my time is spent designing fabrics. I run a small business from my home in Sydney Australia. 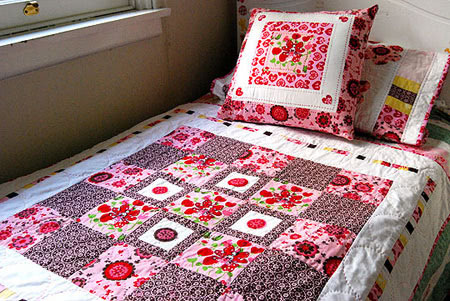 After my daughter was born my Dutch mother in law Daphny came to Australia and had me instantly hooked into quilting. She taught me most of the techniques to patchwork and make quilts. In a magazine she bought I saw that Prints Charming were printing their own fabrics, which inspired me to do the same. Having been a fashion designer for 10 years previously, I just loved printing my own designs onto fabrics and sewing them into quilts and snuggling under them or giving them away for presents. Initially I hand-cut paper screens and printed them onto white fabrics. I then thought I might be able to make a business with the fabrics. So I took my 9 best designs and had them hand-printed in yardage in different colour ways; red, blue and pink with some designs in green as well. I took them to the Sydney Craft & Quilt show where I had a lot of happy customers. Selling out in one day of some fabric. Now I have just released my 5th range and work with retailers around the world. My designs are more colourful now though still screen-printed. The handle is soft and of a really high quality. I try to make a quilt design out of each of my fabric ranges to show people what they can do with the fabrics. My fabrics have a dreamy, whimsical feel and are inspired by my natural surroundings. I suppose they have a modern feel and it is my wish to encourage younger people to join in the love of quilting or even to sew, or make things. I get a lot of lovely emails from people encouraging me to continue. This is a quilt I finished this week using al the fabrics I have designed. Follow me on Facebook. Read my tweets on Twitter. I write a blog adding a new post once or twice a week. très très très beau – véry beautiful – continued for our pleasure. .-= odile bonhomme’s latest post: pochette patchwork =-. 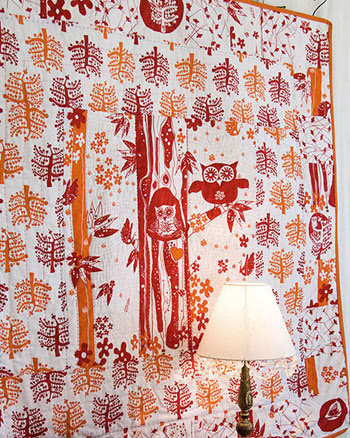 Love the owl quilt.I love any design revolving aroudn the owls…and this one is done with lovely combination and design. Very cool, I love the owl series. I was wondering if the line was carried by a canadian store.